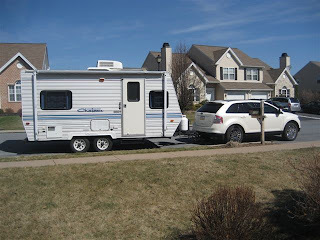 Rich and Janelle bought a travel trailer. Our fall tailgates are going to be even more awesome with this addtion to the Thursday night crew. April is just around the corner! That means FOOTBALL and TAILGATING! It is time to start planning for the Blue and White Weekend Tailgate.The annual Blue vs White Scrimmage is on 4/25/2009. The evites have been sent. Let me know if you haven't gotten them.